This is true. He also could have gone further. The record during recent presidential terms differs from the myths pushed by conservatives not only in terms of total job growth, but also in terms of how the net job growth breaks down between private and public sector jobs. Obama is far from a socialist. 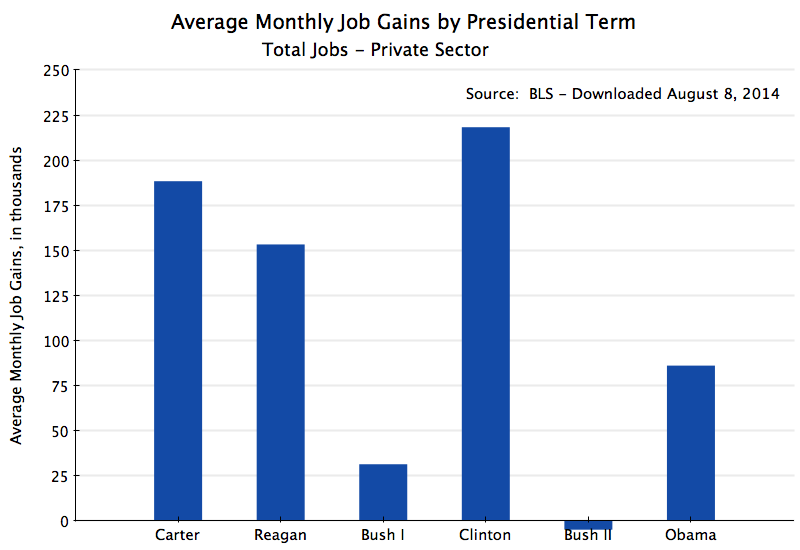 Monthly net private sector job gains are again highest under Clinton and Carter; private jobs in fact fell under Bush II; and growth was quite modest under Bush I. Reagan comes in after Clinton and Carter. They have averaged a growth of a bit over 86,000 per month so far under Obama, but more on this below. Public sector jobs include jobs at all government levels (federal, state, and local). State and local jobs dominate – they currently account for 88% of total public sector jobs. The story on federal government jobs only can differ, and has been discussed in an earlier post on this blog. Note also the difference in the scales in the charts for the public sector jobs vs. the charts for private (and overall) jobs. There are far fewer public sector jobs than private ones in the US economy. What is striking in this chart is the absolute fall in public sector jobs during Obama’s term. They increased for everyone else, but have fallen at a rate of about 10,000 per month under Obama. And has been discussed in earlier posts on this blog, this fall in government jobs during Obama’s term (along with cut-backs in government spending more broadly, which is of course related) can fully account for the slow pace of the recovery from the 2008 economic collapse. 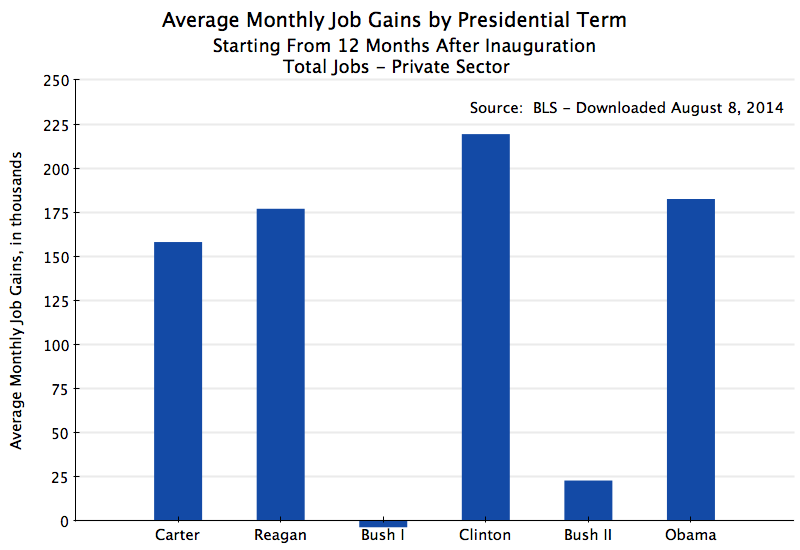 Obama now turns out to have presided over the second highest pace of private job growth (after Clinton), and indeed comes out ahead (even if modestly) of the pace during Reagan. 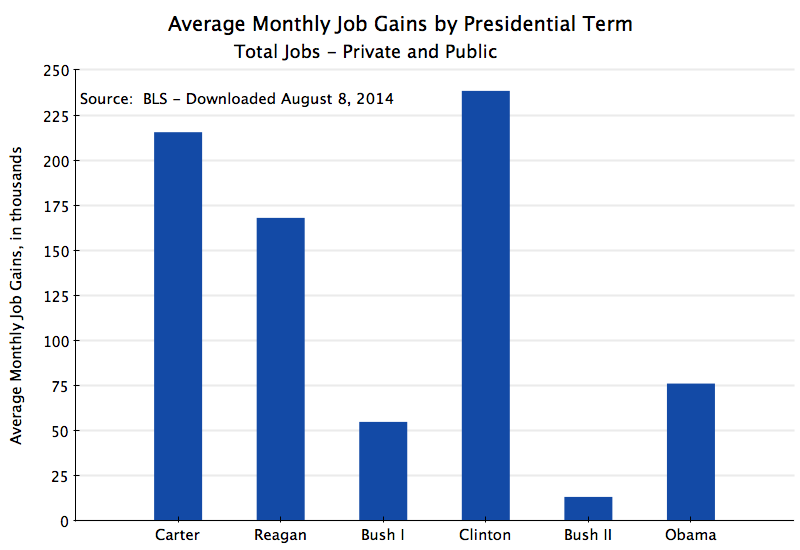 Reagan is lauded as the “job creator” and Obama as the “job destroyer”. The facts do not support this, at least if one is focused on private sector (rather than public sector) jobs. 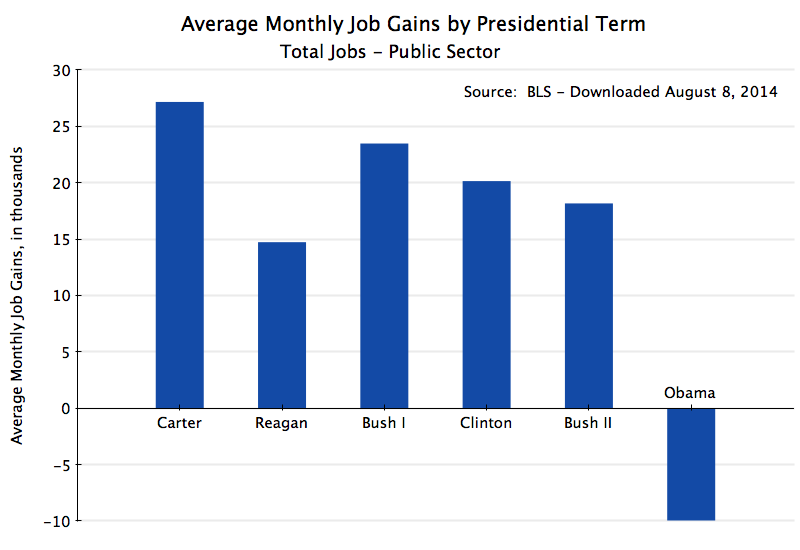 What is striking here is how consistent the pace of public sector job growth now is under Carter, Reagan, Bush I, and Clinton – two Republicans and two Democrats. The differences are tiny. The pace of growth is slower under Bush II, but still substantially positive. 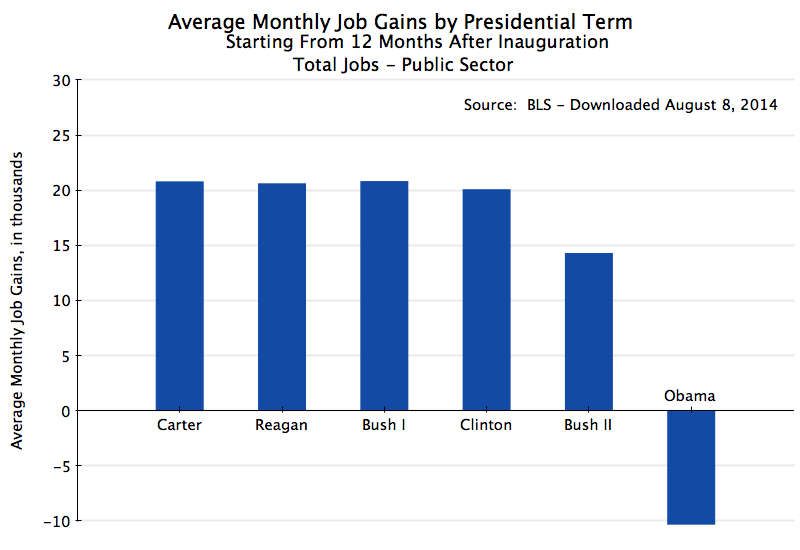 But public sector jobs have fallen sharply under Obama, and only under Obama. If Obama is a “job destroyer”, it is as a destroyer of public sector jobs. One would not expect that from a “socialist”. And private jobs (counting from 12 months after inauguration) have grown faster under this “socialist” than under the hero of the right wing – Ronald Reagan. This entry was posted in Labor and tagged employment growth, government employment, private employment by aneconomicsense. Bookmark the permalink.